The final stretches of the long-awaited Aberdeen bypass are to be fully open by Christmas with the completion of work on the River Don Crossing – though the £745 million project bill is now more than £1 billion, members of a parliamentary committee were told today. A document submitted to the Scottish Parliament by contractors Balfour Beatty and Galliford Try said completion of the crossing would allow for the “opening of the full project” but that the contractors’ losses will be “huge”. The paper was lodged with Holyrood’s rural economy and connectivity committee ahead of a meeting today where contractors were grilled by MSPs amid mounting concern over the delays and costs to the Aberdeen Western Peripheral Route (AWPR). It was also revealed that a major section of the bypass will open next week after a contractual dispute was finally resolved. 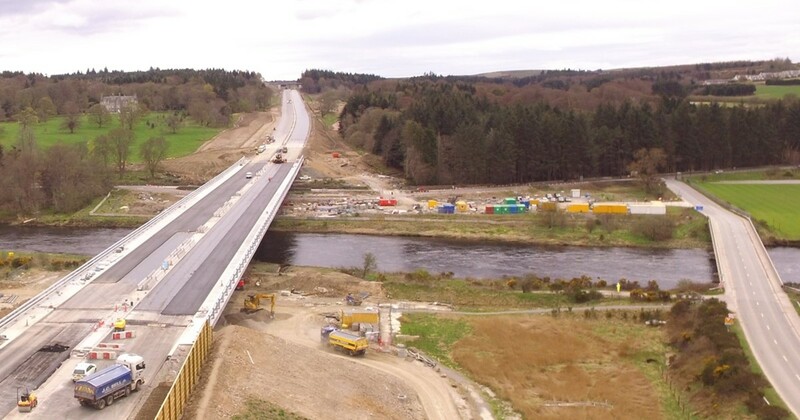 The 20-mile southern section between the A90 at both Stonehaven and Craibstone and the A956 between Cleanhill and Charleston was completed in October but its opening was delayed due to a disagreement between the Scottish Government and joint venture Aberdeen Roads Limited (ARL). It is understood negotiations have now been concluded, and the contractors are expected to open the significant section within days. This development means more than 85% of the project will be open to traffic. The contractors also said the River Don Crossing and the other unopened sections of road will open by Christmas, unless there is adverse weather, though snagging work is to continue until March. “Even after resolution of the claim, the joint venture partners’ losses will be huge,” the document added. During today’s meeting, Balfour Beatty major projects managing director, Stephen Tarr, Galliford Try’s construction and investment chief executive, Bill Hocking and ARL director, Brian Love were asked by North East MSP Mike Rumbles if the £745m project had now run into the hundreds of millions. He added the three firms hope to recoup some of that from Transport Scotland, but refused to say how much was being claimed. He added: “One of the most significant (issues) is the early work with the utility providers. Transport secretary Michael Matheson expressed delight that the section of the project will open next week following weeks of “intensive talks” but asked why his personal intervention was required. Mr Matheson said: “This is the news we have all been waiting for. I have explored every possible avenue with Aberdeen Roads Limited to open this section of road as soon as possible and I am delighted my efforts to bring this matter to a positive conclusion have been successful.